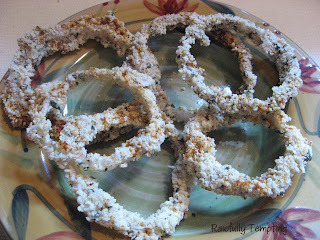 My friend Marcia mentioned she made onion rings for her hubby, and I've been thinking about them for days. I finally came up with this recipe, and WOW! They are super tasty. It's so funny because you can only eat a small amount of them. Raw food is so nutrient dense, a little goes a long way. Mix "Egg" Mixture ingredients together and whisk well. In a large bowl, mix Batter ingredients, except for paprika. Dip a couple of onion rings at a time into "Egg Mixture." (you can let them sit in this mixture for a bit to absorb it.) 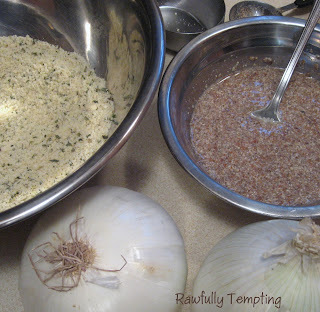 Place onion slices on a plate and sprinkle with Batter mix on both sides. (If you dip, it gets very clumpy and you waste the batter.) If not coated well, dip again in "Egg mixture" a second time, and sprinkle again with Batter mix. Repeat for remaining onions. Sprinkle with paprika. Place on a non-stick dehydrator sheet and dehydrate at 125 degrees for 1 hour. Adjust dehydrator to 110 degrees and dehydrate for 4 hours. Flip onions and continue to dehydrate until crispy on outside for about 4 to 8 hours. Breading should be dry and crunchy, but onion still moist. Store in refrigerator and reheat in dehydrator prior to serving. TIP: Combine any left over Batter with remaining "Egg" Mixture and press into little circles or squares. Dehydrate along with onions. They make pretty tasty crackers or croutons!!! These sound great! Definitely going to give them a go! Those look really great! I wonder how they would be dipped in raw ketchup? I use to eat onion rings dipped in ketchup as a kid.